So, I do many things to ensure that she is eating well. I limit her salt intake and avoid processed foods whenever possible. I feed her fresh or frozen vegetable instead of canned vegetables. I only give her milk or water, never fruit juice (pediatricians discourage giving children fruit juice due to the high sugar content and low nutritional value). I limit her sugar intake - she did not have any refined sugar until she was 22 months old and now that she is older she is allowed to have some, but I try to limit the amount of refined sugar she consumes. Refined sugar has a higher glycemic index and will cause her to get a super sugar high (and then a big crash, which makes tantrums more likely). Given all of this, I've had quite a time trying to find healthy snacks for her to eat. You don't realize how everything has sugar in it until you start reading labels and looking for things that don't have added sugar! (Not to mention how manufacturers will sometimes try to hide the sugar in their ingredients list by using dextrose, sucrose, high fructose corn syrup, etc.) So, when I stumbled upon Peeled Snacks at Starbucks, I was really excited. Could a dried fruit snack with no added sugar, just fruit, really taste good? 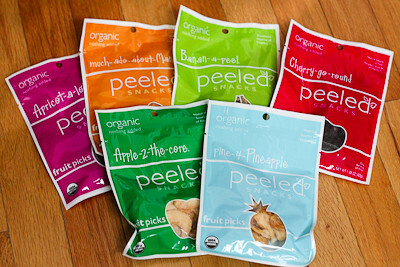 Well, the folks at Peeled Snacks were kind enough to send me one of their Organic Fruit Picks Variety Packs that includes several of their organic fruit snacks: pine-4-Pineapple, much-ado-about-Mango, Banan-a-peel, Apricot-a-lot, Cherry-go-round and Apple-2-the-core. My favorite was the apricot; I'm not sure what it is about them (maybe they're sweeter? ), but I found them to be much better than the ones we usually get from Sam's Club. I loved them all, but didn't care much for the dried banana - the pieces were a little tough (my daughter still loved them). What did my little girl think about the variety pack? Well, her favorites are the dried pineapple, dried apples, and dried cherries. She will pretty much oblige to anything for some Peeled Snacks! :) I can't tell you nice it is, as a parent, to be able to find healthy snacks that my daughter loves. Would you like to try some Peeled Snacks, too? Enter now to win your own Organic Fruit Picks Variety Pack. Just go to the Peeled Snack website and check out their Organic Fruit Picks Variety Pack, then leave me a comment here, telling me which type of dried fruit is your favorite (or which one you'd like to try most). 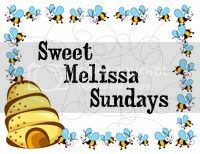 For one additional entry, "like" Good Eats 'n Sweet Treats on Facebook, then come back here leave a second comment telling me that you "liked" my page. I would love to try the mango! Thanks for hosting this giveaway! I think I would like the Cherry-go-round. Ooooh.... tough call between mango and cherry. I would love the pineapple, but my kids will prefer banana! dried apples are a personal favorite. Hard choice! I've never had dried cherries, but I already know I love dried pineapple. I guess I'd stick with tried and true pine-4-pineapple. Apricot, no Banana, or Mango.... hmmm, well lets stick with Mango! love dried pineapples n the tempting flavor.. I LOVE dried apples and mangoes, but am dying to try the cherry. It all sounds delicious! I love dried mango (and fresh too, but dried is much more diaper-bag friendly!)! !